For over sixty years, Krohne has been active in the water industry. In fact, the German-based company first introduced its electromagnetic flowmeter (magmeter) for water, wastewater, additives and sludge in 1961. Since then, it has not only developed a complete portfolio for flow measurement, including partially filled pipes, but also level, pressure, temperature and process analytics to equip waterworks, sewage treatment plants and all networks in between. 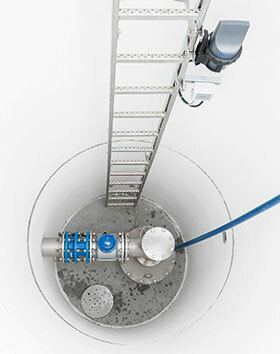 Since magmeters remain the standard in water measurement, Krohne has widened its Optiflux portfolio to include many different liners for applications from clean water to sludge with high solid content. However, the development of standalone, battery-powered electromagnetic water meters has mostly taken place in the last ten years. Although it was demanded by customers as an alternative to mechanical meters for points where no mains power is available, the development of these meters depend on a special design of the measuring tube. Introduced in 2009, the Waterflux battery-powered flowmeter (certified to MID MI001 and OIML R49) has been a very successful product in the potable water market. It features a unique rectangular measuring tube design that does inlet or outlet sections, which allows for compact installation and a small overall footprint. Even better, there is no need for grounding rings because, as standard, the flow sensor has a reference electrode for grounding and a special coating allows for subsoil (IP68) installation. As water meters are often installed in remote locations, reducing the frequency of visits to the sites and the time spent on set-up and maintenance is crucial. This relies on aspects such as a simplified installation, integrated diagnostics, a long battery lifetime, remote communication options and low overall maintenance requirements of the meters. The features and options of Waterflux contribute to these targets and the device is continuously updated to keep up with modern requirements. In terms of installation, the polycarbonate converter housing with protection class IP68 rating is now standard for both the compact and the remote version, that is, for temporarily flooded measuring pits. It features IP68 Mil connectors that do not require wiring on site, and a small installation footprint to fit into electrical cabinets. For locations where mains power is available, Waterflux is now offered with an external FlexPower unit to connect the meter to a power source on site, e.g. electrical grid, solar panel or a small windmill. The integrated pressure and temperature sensor allows the use of Waterflux for various tasks in drinking water networks: Flow and pressure measurement data are an important input for pressure monitoring, maintaining the water balance, district zoning (DMA) and for leak detection when comparison of pressure and flow values are used as methods. Eliminating the installation and wiring of external pressure sensors, the integrated device can provide an alarm when a programmed upper or lower limit is reached. The same applies for the integrated temperature sensor that can serve for quality monitoring of potable water, also without the need to open the line a second time. Alarms can be generated via the status output or via Modbus when critical limits for pressure or temperature are exceeded. Current communication options meet water companies’ increasing demand for more measurement and status data. The Modbus RTU output offers an alternative to the two-pulse and two-status outputs. Transferred data includes measurement information (sum, forward and reverse counters, flow rate), status data (battery lifetime, meter status), actual values for pressure and temperature, and alarms. In addition, remote data communication solutions are also available off-the-shelf.